The Happy Human is the international symbol of Humanism. You can download versions of the original symbol at the bottom of this page.It is used around the world in various forms and flavours by national and local humanist organisations and by Humanists International. The symbol was chosen in a competition organised by the British Humanist Association in 1965. It was designed by Dennis Barrington. 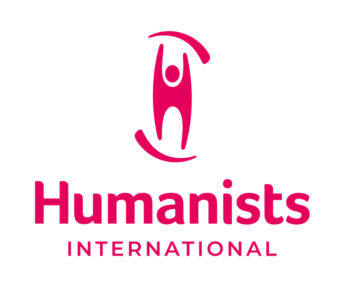 Humanists UK used the original Happy Human (first known as the Happy Man) in its own logo for some years and encouraged use of the symbol around the world, either in its original form or tailored for individual organisations. In 2005 the Norwegian Humanist Association offered the world a slightly re-designed, curved version of the Happy Human (see the “2005” downloads below). In previous years, under its old name of the British Humanist Association, Humanists UK adopted a distinctive “Bendy Human” logo for its own use. Humanists UK holds the trademark for the original Happy Human symbol and freely licenses the original 1965 design for use by bona fide humanist organisations around the world. Where organisations, like Humanists UK, have adopted a distinct version of the Happy Human as their own logo, then other organisations should not copy the design for themselves. Organisations need to protect the boundary between their work/identity and that of other humanist organisations, independent groups or individual humanists. This can be very important in company and charity law. Humanists UK has digital “affiliation badges” available for use by local, student and special interest groups which affiliate to the national organisation. These images of the Happy Human can be used freely to illustrate or refer to Humanism, and may be adapted or modified by genuine humanist organisations for their own use.